This month (September 2018) Google is celebrating its 20th birthday. 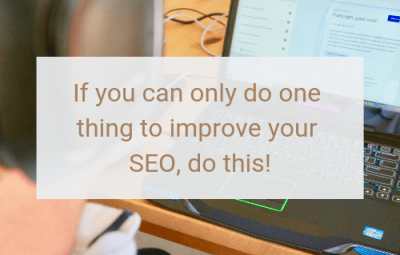 To help this search engine giant throw a bit of a party I want to share 20 SEO tips with you to help Google love your website to bits! It’s crazy to think 20 years ago when Google was created, I was about to turn 13. I was obsessed with Buffy the Vampire Slayer and I knew the song Never Ever by the All Saints, word for word. We also had one of those dial-up internet connections at home that everyone in the house could hear dialling up. Wow times have definitely changed and there’s definitely no way I would have guessed that 20 years down the track, I’d be doing this. I don’t think we even talked about the internet during studying for my Bachelor of Communications. I guess my admiration of Buffy Summers and cats, may have been a slight precursor to my love of all things online and Google though. For Google’s birthday, I am going to share some totally awesome SEO tips to help you get your website on track when it comes to attracting people to your website who are searching for businesses like yours online. Metadata is the snippet of words that show on the search result pages. This important content is the very first impression someone sees of your business and website when searching through Google. It’s made up of a title and description (Google can sometimes opt to show their own description based on the content on your page FYI). Adding a unique meta title to your web pages is vital and this title should accurately reflect what the page is about. It’s so important you optimise these, especially for pages you want people to click through to directly from the search result pages. If you haven’t migrated from HTTP (not secure) to HTTPS (secure) then you need to do this ASAP. And if you’re launching a site, make sure it’s HTTPS from the getgo. Ain’t nobody got time for a slow website! Shaving a few seconds off your page load times can make a huge difference between someone buying your product/contacting you and leaving your website to only go and do that on your competitor’s website. Speed is key for both desktop and mobile websites. Images are typically one of the biggest culprits that slow a website down. They are also a great visual search tool for anyone searching on Google images. Therefore, make sure your images are as small as possible prior to uploading (under 100kb if possible), give them a relevant file name and add ALT text after uploading to your website. This should be no surprise. More and more people are searching from mobile devices. Which means your website needs to be accessible and usable by people on a mobile. Make sure to check your website regularly. What is your website doing for you? If you’re throwing money at it, then it should be adding value to your business right? Using tracking, like Google Analytics, will help you see how people are finding your website and how they are interacting with it. From this data, you can then craft your digital strategy to get the best results from your investment. The GoogleBot is a crawler which crawls websites to see how they are structured and what’s on them. With this information, it then adds your web pages to Google’s index. By adding internal links on your pages, like if I was to link to this post on SEO friendly blog post tips, it’ll help Google understand my website better and pass value between my web pages. The anchor text (words that you hyperlink) should be over words that explain to the user and Google, what they should expect to see on the linked page. Also, don’t forget to make sure people can see where your internal links are. Make them stand out. When another website links to one of your pages, it’s like a vote of confidence in Google’s eyes. Therefore if you have a lot of relevant websites pointing links to your website, not only will you be getting referral traffic, but Google will think higher of you. You can obtain backlinks via media mentions, online business directories, guest posting and more! It’s free, so why wouldn’t you claim it! Google business and maps listing’s shows on the search result pages and there’s actually a lot of fun things you can do with your Google My Business listing to gain extra attention on the search result pages. A site: search is where you type into Google, site:grandcrudigital.com.au, but replace my domain with yours. By doing this, you’ll see all the pages on your website that are in Google’s index. From here you can check all your important pages are listed and also see how your metadata is looking. Google Search Console is a free tool from Google. It helps you understand how Google sees your website and if there are any red flags which may be hindering your performance. If Google has any important updates that may affect how your website is indexed, you’ll also get notifications in here. Content is important to SEO because Google reads your content. But the key to having content that Google will love is that the content is useful, interesting and easy-to-read for your customers first and foremost. Make sure all the content on your website is written for your customers and that it will help them on their journey with your business. Heading tags are typically shown in content management systems as ‘heading 1’, ‘heading 2’ etc. The heading 1 on a page should be your main title, and subheadings in order of importance should be made as heading 2, 3, 4 etc. This helps to tell Google the hierarchical structure of your content. Structured data is code that goes around your content. It tell’s Google directly what elements on your page are, such as an address, a phone number, a blog post, etc. Most websites have a tree-like structure. Your homepage is the trunk and you have the main topics coming out of this and under these your sub-topics. In web-speak, we call these ‘subfolders’. Basically, all your content should be grouped into specific sections on your website. Breadcrumbs are a small row of internal links typically at the top of the page under the main heading. They show where you are on the website. A user can then click to go back to the main topic or the homepage. Google also loves breadcrumbs as again it helps to explain the structure of the website to the GoogleBot. Someone lands on a 404 error page when they click on a broken link. It’s best to try to avoid this at all costs, but it’s just one of those things that can happen. So it’s best to be prepared for it. By creating a custom 404 page it’ll help users navigate back to your website, hence, improving the user experience. A URL is the website address for a particular page on your website. Where possible you want to keep these short and simple. If someone were to see the URL it should convey what they are going to see on the page. Avoid using unnecessary numbers and underscores (use hyphens instead). If you’ve got a website and you’re actively making sure it’s the best thing since sliced bread, then make sure people know about it. Add it to your bio on your social media profiles, to your business cards and on business signage. You can even look at sending out email newsletters to let people know when you add new content to the website. And last, but definitely not least. If you’re going to DIY SEO or you’re going to hire an SEO consultant to help you, make sure you/they have read Google’s SEO Starter Guide. This is the bible to SEO best practice and should be followed at all times. I really hope these SEO tips help you get on the road to becoming great friends with Google. I’d also like to point out that I share plenty more tips on my social media channels. If you require an SEO consultant to help you with your website on an ongoing or one-off basis, then please don’t hesitate to get in contact today.